Risen is an old-school role playing game that does very little to make itself appealing to the more “casual” gamer. In terms of overall characteristics, Risen is similar to games like Oblivion- but whereas Oblivion tries to make it easy to progress and overcome your mistakes, Risen makes no such allowances. Interestingly enough, although I generally like “easier” games, I’m actually really enjoying Risen… on the PC. From what I’ve seen and heard, the XBox version should be avoided. 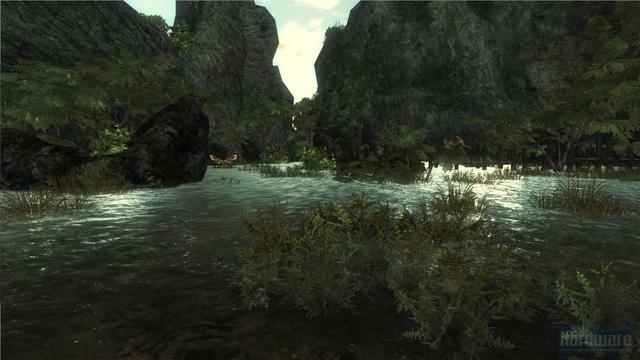 Risen is the latest game from Piranha Bytes, the developer behind the Gothic series. And in fact, many would say that Risen is actually “Gothic 4”, and those saying this likely wouldn’t be far off the mark. Piranha Bytes lost the right to use the name “Gothic” to their former publisher. This may not be a bad thing: Gothic 3 (the last game released under this name) was a bit of a buggy mess, and so distancing their latest game from this name for now probably avoids some negativity. There are a few oddities to keep in mind when looking at reviews of Risen. Firstly, there are significant differences between the PC version and the XBox version (currently only released in Europe). Both games are functionally the same, but the user interface for the XBox version is apparently nightmarish: the complex keyboard-driven UI was apparently “grafted” and squeezed onto the XBox controller with confusing and complicated results. Further, any XBox reviews written thus far are for the original European release: the developer has apparently delayed the North American release in order to try to resolve many of the user interface issues identified. My review here is strictly of the PC version. It is worth noting that most reviews of the PC version are scoring the game somewhere in the 60-70% range, where reviews of the European XBox version are in many cases scoring in the low to mid 40% range. Again, the underlying game is the same in both versions: the difference is the clumsy user interface conversion to the XBox platform along with some graphics degradation. Risen starts you off as the traditional “survivor washed up on the shore”: it is very reminiscent of the beginning of Age of Conan, actually. You quickly discover that strange things are afoot: a religious order has taken control of the island you arrive on, declared a sort of martial law, and sealed all of the citizens in the nearest city. Simply by wandering about you are automatically a criminal: in violation of the orders of martial law. Ancient and previously unknown ruins are rising up out of the ground throughout the island, starting a sort of gold rush as adventurous souls try to gather up artifacts and golden trinkets from the suddenly revealed caches. Unfortunately, monsters and traps abound in these places, and most of the wealth seekers end up dead. A bandit leader has gathered a small cadre in the woods, providing a possible home and camaraderie for like-minded adventurers. The religious order seems to be seeking something amongst the artifacts as well, and is capturing/arresting any unauthorized looters, seizing their treasures, and conscripting many people for unknown reasons. Your choice early on is to decide whether to side with the rebellious treasure-seeking adventurer/bandits, or to join the Order’s numbers. This is far from a black and white choice: things are not as they seem. And all around the island roars an unremitting tempest, rumoured to be the wrath of ancient gods. What is holding it at bay? And for how long? The character graphics in the PC version are workmanlike- nothing special, but reasonably good. Some of the environmental graphics can, at times, be gorgeous: not hyper-realistic, but stylized. Overall, the impression is of a well-realized world with a definite style, but nothing which moves the state of the art forward. On a high end PC (3.6 GHz quad core w/ATI 3870×2) playing at 1920×1200, the images are crisp and screen refresh rate is reasonably consistent: there are occasional frame drops, but they never impacted the game play significantly. Apparently the graphics on the XBox are significantly poorer, particularly character graphics. The worst aspect I’ve heard reported on the XBox is that the world is quite dark and the XBox version has no ability to adjust gamma (brightness). The PC version does provide this facility, but thus far I haven’t found darkness to be a problem. Audio in Risen is also simple but effective. The music is very repetitive, at least to my ears, but easily ignored: if you can’t do great music, at least make it unintrusive. Sound effects are similarly functional, with limited use of directional sounds. However, because of the “deadliness” of monsters in the game, I often found myself spinning around in response to the rare sound behind my back, and in that sense the effects are good. “Atmospheric” sounds are bland to the point of being irritating. There are some “miscellaneous scary monster noises” that seem to play throughout the game any time you are outside the city that have no apparent relationship to nearby creatures that, in particularly, I find aggravating. Risen is an old school RPG in several senses. Your character is “fixed” in appearance and gender, but has a complex set of skills and abilities that you can train up. As you level you gain points you can spend on training: training involves spending these points plus some gold to improve your selected skill. Note that you have to find a trainer for the appropriate skill: you can’t just do this in the middle of the woods somewhere. Skills do not improve through use, but only through training. As per traditional RPGs, you also have “characteristics”: strength, wisdom, etc. These can be improved through potions, herbs, magic items, and some trainers. You must make certain choices during the game that will constrain your future options: are you a mage, a bandit, or a warrior of the order? Based on your choices, you will have some limitations on how you can develop your abilities in the future. It is impossible to be a true “jack of all trades”, although it is possible for all the character choices to use some weapons, some magic, and some “thief like” skills. What differs is how far you can develop those abilities. Note that the only path I’ve followed thus far is the Mage, so I am less familiar with the other choices. Mages have access to develop all magic skills: runes (casting many/complex spells without materials plus creation of scrolls); crystals (casting a limited number of “pure energy” spells based on the traditional four elements), and spell scrolls (spells cast from a pre-created scroll). Mages can max out their staff fighting skills, but are limited in terms of armour and weapons they can effectively use. Warriors of the Order are more like battle mages. They can use crystals and scrolls, and also have full access to heavy armour and blade weapons. They can not use rune magic. The game does nothing to make your choices here universal or convenient. For example, if you want to be a mage or Warrior of the Order, you have no choice but to join the Order: the bandits have limited access to the ancient knowledge. If you don’t like it that way, tough: that’s the way the world is. These factors combine to create an experience for me at least that is both enjoyable and frustrating. You really do feel weak and feeble early on, but nothing stops you from taking on a vastly overpowered foe and getting lucky. By mid-way through the game (where I am now), my character and I are starting to feel competent. I can take a few hits, hold my own against two or three foes, and know how to “split” most larger groups. I’m still only able to cast a handful of spells, and I still get in over my head pretty regularly and die with alarming frequency. But the save game/ quick saves make this relatively easy to recover from. In terms of size, Risen is big: I’m probably at most a third of the way through and have played for a total of about 20 hours. I don’t know if the following chapters (I’m on chapter 2, there are four in total) are equally large, but the impression I get is they are at least as lengthy. That would suggest that Risen is good for 60 to 100 hours of game play, assuming your play style matches mine. I’m not one generally to use game cheats to solve all my gaming problems. However, I found Risen to be tough enough that I imagine most people, myself included, will feel that cheating is a viable way to continue on to the more enjoyable stuff. Its your game, you choose how to play it. In that vein, I’ll give a few pointers regarding how to cheat on the PC game. Risen has a “testing” or development mode that you can invoke. In this mode you can open a console and type various script commands that will allow you to add items to your inventory, increase your abilities, change NPC behaviour, and summon/delete NPCs. Note that using these “cheats” may cause problems in the game: for example, deleting a critical NPC may make it impossible to finish the game, and choosing to fill your inventory with every item in existence may cause a crash. You’ve been warned. I have used cheat mode once so far: when I got stuck on a critical quest in the monastery. I unknowingly stole something belonging to an NPC that I later discovered was I needed to talk to in order to progress, and didn’t have/couldn’t find a single copy of the Jest scroll. So I cheated and put one in my inventory… while I was cheating, I also bumped my staff skill a couple of points and gave myself the ability to sneak. Is this kind of cheating really wrong? That is entirely in the eye of the beholder. For me, it got me over a few bad spots in the game play that would have frustrated me. For someone else, the lack of a scroll would have been grist for an entirely new adventure: the quest for the Jest. Note that the “opening every cupboard/taking everything that isn’t nailed down” mode of play is a bad habit I had from previous games. If I had been playing as if I were a real character in the world, I wouldn’t have been going around opening everyone’s lockers and taking their stuff to begin with. In a more forgiving game, there would have been no need for the scroll as I’m sure the NPC would either conveniently “forget” I had robbed them or there would be no way to make them mad like that in the first place. But how realistic is it to be able to walk past a home owner, steal all of their meagre possessions, then have them willingly and politely talk to you/offer you kindness a few seconds later? Not very, and I can respect Risen for punishing me for doing that. That said, if I were playing a traditional pen and paper RPG and got totally stuck, most DMs would give me something to get me over the hurdle: in a computer game like Risen, that benevolent DM is totally lacking, and the game cares not a bit if you are frustrated. Another way to cheat, of course, is to read various quest walkthroughs. One of the best I’ve found can be found here. To use my pen and paper analogy again, this would be somewhat equivalent in effect to buying the same module your DM is running, or sneaking a peak at their notes. But once again, it is a way to overcome progress-stopping obstacles that a real-life game master would likely observe and correct to keep game flow intact. You can buy the game online via Direct2Drive for about $40- I couldn’t find it in any of the usual stores (e.g. : BestBuy, London Drugs, Electronics Boutique. I’m currently in the middle of Oblivion but am always on the look out for another one to conquer. Does this have any type of DRM or other requirement (like internet connection required) to play it? If so, please elaborate. For me DRM’s are deal killers.